Tight, firm skin requires good elasticity. Elasticity means the ability of the skin to snap back or tighten after it has been displaced or pulled away from the body. Good elasticity depends on healthy collagen and elastin fibers that lie very deep, near the bottom of the dermis. Collagen and elastin fibers act like small rubber bands that hold the skin tight against our body, and pull the loose tissue back when it is stretched or pulled. Aging, sun damage from ultraviolet (UV) light, smoking, stress, excessive alcohol intake and an unhealthy diet and lifestyle all destroy collagen and elastin in the dermis and cause the skin to loosen and sag. Although it is located beneath the epidermis, it is changes to the dermis that cause the outer skin to wrinkle and lose elasticity. As we grow older, the amount of fat found in our lower layer of skin decreases, our glands produce less oil, and collagen and elastin fibers lose their elasticity. The natural process of cell reproduction in the dermal layer also decreases as we grow older, resulting in a slower rejuvenation of our skin cells. SkinTyte™ emits energy in the infrared spectrum, 800-1400 nm, and provides dermal heating for the purpose of elevating tissue temperature within the dermal collagen matrix. The immediate response to this thermal exposure is a contraction of the collagen and elastin fibrils. In the longer term, fibroblasts are activated stimulating the production of new collagen, elastin and other components of the extracellular matrix in response to wound healing which takes place for up to 6 months after the initial heating. This tissue remodeling results in a thickening of the dermis and the shrinking of the elastin fibers, resulting in the improvement of skin firmness. Safe and optimized for all skin types, SkinTyte can predictably, effectively, and comfortably treat any area of the body where improvement is desired, giving clients a firmer and more youthful appearance. SkinTyte™ utilizes advanced infrared light technology, and client tailored filters to deeply heat dermal collagen while continuously protecting the treated epidermis with sapphire contact cooling for optimal clinical endpoints, safety and comfort. With no need for a topical anesthetic, the energy is delivered in rapid, gentle pulses to promote contraction and partial coagulation of the collagen, initiating the body’s natural healing process, leading to increased tissue firming. Clients will feel comfortable throughout treatment. And, since there is no downtime, regular activities can be resumed immediately following treatment. 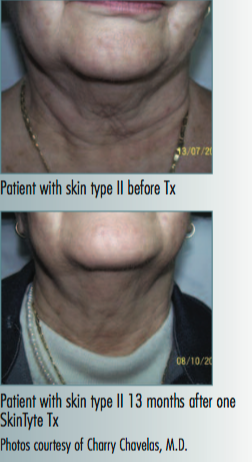 To see optimal results with SkinTyte™ a minimum of 4-6 treatments is recommended 3-4 weeks apart. The full effects of the SkinTyte™ treatment appear gradually. The changes from the fibroblast stimulation can take 3 - 6 months after the last treatment to be observed, although some clients do see them sooner. 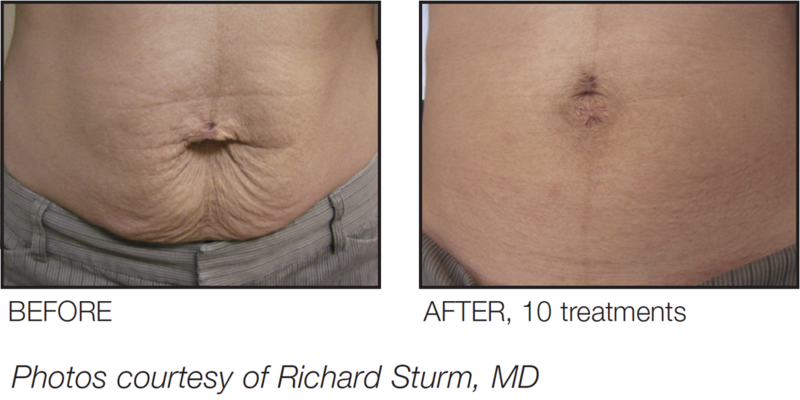 Full results have been known to last for up to 6 months, but recent studies have shown that some thermal collagen modifications have lasted up to several years, depending on the rate of the clients aging process. Maintenance treatments are recommended 2-4 times a year at 6-4 months intervals. 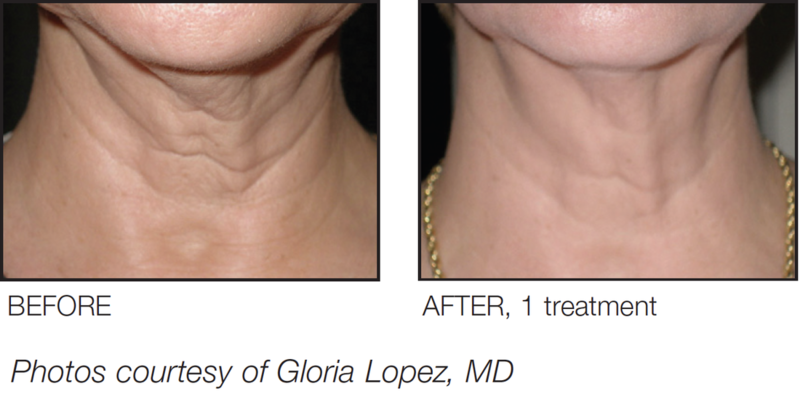 "I’m most impressed with the SkinTyte’s efficacy in treating the neck and lower face. Patients can expect immediate firmness, followed several months later by a longer lasting firmness."